The ‘Naked Adventurer’, Keith Whelan, is forced to give up his attempt due to health concerns and damage to his boat. Keith Whelan has been forced to abandon his solo journey across the Indian Ocean due to damage to his boat which will take too long to repair. THE KILDARE MAN who had hoped to set a new world record as the youngest man to row solo across the Indian Ocean has been forced to abandon his attempt. Keith Whelan – the ‘Naked Adventurer’ – was rescued off Western Australia yesterday morning after sustaining a gash to the head, when a giant wave caused him to bang his head off a bolt on his boat. Whelan was rescued by a passing cargo ship yesterday, but his specialised rowing boat sustained significant damage as the cargo boat attempt to hoist it on board. The trip, which would take about 14 weeks, could only be attempted during a particular time of the year – and the time needed to repair the boat would push the trip outside of the narrow weather window available for the challenge. Keith’s challenge had been a fundraising effort for Keep A Child Alive, an anti-AIDS charity for which he had already run the New York Marathon. A spokeswoman for Keith, who remains in Australia for the time being, said Whelan might choose to attempt the trek again next year. “From speaking to him, he’s been very unlucky – but he won’t give up just yet,” she said. Keith’s mishap has become a cause celebre in Australia, and Keith is currently staying overnight in Perth at the expense of a national TV network ahead of an appearance on a national breakfast TV show tomorrow morning. 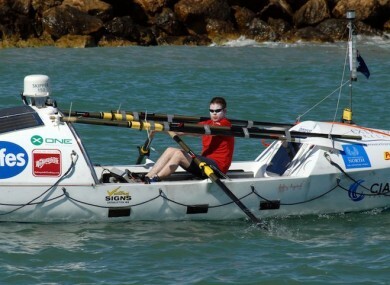 Whelan’s trek would also have seen him become the first Irishman to make the solo rowing journey across the Indian Ocean, by propelling himself from Geraldton to Mauritius. Email “Naked Irish rower forced to abandon solo Indian Ocean crossing”. Feedback on “Naked Irish rower forced to abandon solo Indian Ocean crossing”.